For non-Brits, the U.K. has a strange annual ritual called ‘The Budget’, at which time the Chancellor of the Exchequer (the U.K. minister of finance) unveils his tax and expenditure plans for the year. For two to three days, ‘The Budget’ acts as a media neutron bomb, destroying any other debate. The odd geopolitical story (Crimea) or human interest (MH370) story may limp on, but nothing much else can survive. Most PR staffers are acutely aware that ‘The Budget’ is a Bermuda Triangle for any press release and take a long weekend off. But not all. The Legatum Institute (a non-partisan London-based think tank) chose budget day to release an important report called “Wellbeing and Policy“. Not surprisingly, media coverage was meagre, with The Financial Times being a notable exception (here). The report is authored by the great and the good of happiness academics including Angus Deaton, Martine Durand, David Halpern, Richard Layard and Gus O’Donnell. In my humble opinion, the burgeoning field of happiness economics is a truly exciting field of the social sciences—whose time has really come; as such, this report is important. Moreover, as we contemplate a world facing ever greater headwinds to that of the traditional metric of success, GDP, happiness economics provides us with a rare opportunity to have our cake and eat it. That is, it should help us intelligently adapt to low or zero growth due to climate change and resource depletion, but at the same time maintain, or even improve, our level of social welfare. The Legatum Institute report gives ground for some optimism (which is usually lacking in this blog). 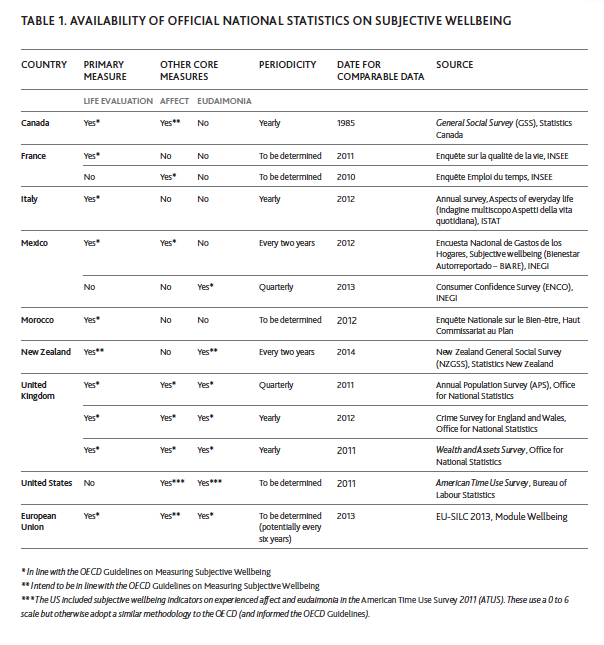 For a start, a wave of national statistical offices have started to collect data on subjective wellbeing (click for larger image). Moreover, the somewhat vague concept of ‘happiness’ has now been deconstructed to the extent we can isolate its three main elements: life evaluation (the remembering self: how do your rate your life), affect (hedonic feelings of pleasure or pain, joy or sadness, stress or relaxation) and eudaimonia (a sense of purpose to one’s life or ‘flourishing’). I’ve posted frequently on this topic, as, for example, here and here. A1 relates to life evaluation, A2 covers (very simplistically) eudaimonia and A3 through A5 positive and negative affect. It is very easy to pick away at the arbitrariness of these questions. The “Wellbeing and Policy” report references a New York Times article (here) covering the work of Martin Seligman, one of the pioneers of the ‘positive psychology‘ movement, in which Seligman struggles to reconcile the eudaimonia produced by ‘flow’ from that of the satisfaction of just winning. Is playing bridge for the feeling of flow any more worthwhile than playing it just to win? Dr. Seligman doesn’t want to judge. I am not so sure. In Dr. Seligman’s world, there exist bridge players who evidence no sense of ‘flow’ nor sense of satisfaction in the game they play. 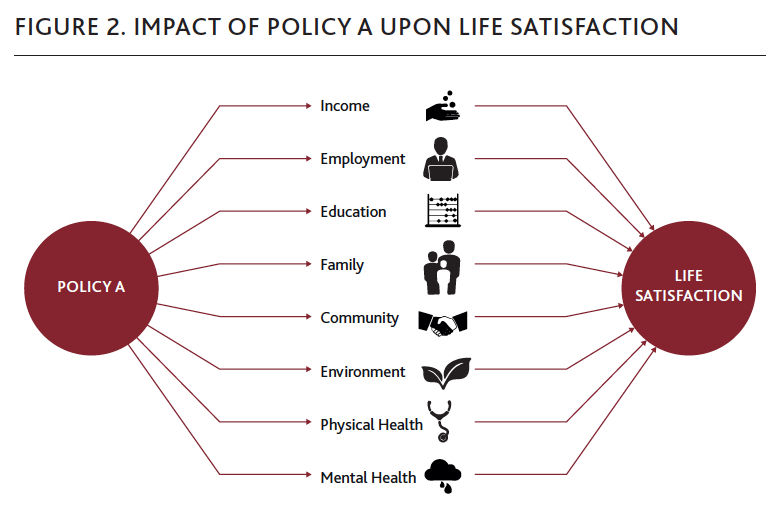 But I wonder how they evaluate their life satisfaction or positive and negative affect. Yes, this is all difficult, but just because it is difficult does not mean it lacks depth. A silent revolution appears in train, where we collect ever more data on happiness and decide what that data means. ‘Happiology’ is not GDP for hippies. I would turn this around: GDP is the measure of success for the educationally subnormal. It’s both simple and stupid. We are just starting to get to grips with what happiness means—and its complicated. But we are adults, and it is time to put away childish things—such as our obsession with GDP.